Over the years I have been grateful to have studied under some great professors regarding denture making because full dentures. Many newer graduates are seeing fewer cases of full dentures and find it harder to gain experience. 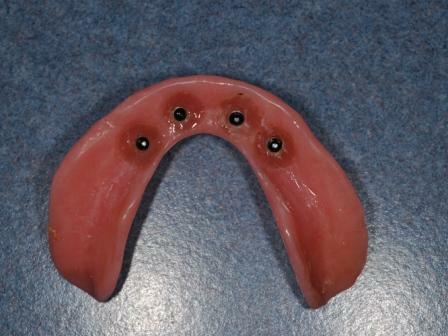 Nevertheless, even well made full dentures are often a nightmare for both dentist and patient. Bottom dentures especially have little going for them – the jaw atrophies when you loss teeth which leaves no support to bite against, no jawbone left to hold the dentures firm, and the end result is poor diet, discomfort, ulcers and unhappy people. 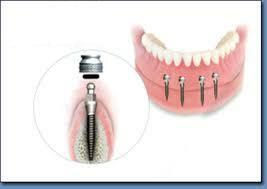 I have been excited to see mini dental implants as another option for us to help retain full dentures. Traditionally, full implants were required at great cost, and many patients don’t have enough bone to support these implants, or the money to pay for them. The mini dental implant is an in between option – aimed at stabalising the denture against loosening or falling out, but still being removable. I have just finished a case and the patient is thrilled. he lost his teeth 3 years ago and hasn’t been able to wear a denture since – now he is regained his confidence an smile. This entry was posted on Monday, June 6th, 2011 at 5:51 pm and is filed under Uncategorized. You can follow any responses to this entry through the RSS 2.0 feed. You can leave a response, or trackback from your own site.